Grilled pizza is one of those meals that sounds daunting, but in reality is incredibly easy and better yet, utterly satisfying. Yes, we all know the easiest route is either a few taps on a smartphone, or perhaps a short drive to the closest pizza joint, but there is a huge distinction between easiest and best. Here, I give you the best. I've talked a lot about grilled pizza both here and on the Weber blog, but I've yet to dive into how I create pizzas on Weber's Summit Charcoal Grill. While pizzas, often dough directly grilled on the grates of the Performer, or even the Summit Grill Center, are easy and straightforward, my first look at the SCG piqued my pizza making interests. Even though I can use a pizza stone on the aforementioned Performer & Summit Gas, it's easier just to go dough on grate as either the stone is subjected to too much direct heat, or conversely, not enough indirect. With the diffuser plate on the Summit Charcoal Grill, I quickly realized I could have the best of both worlds. Super high and completely isolated indirect heat. In essence, my perfect backyard pizza factory. Mix together the yeast, sugar, and water to form a slurry. Let sit for several minutes. Note: For great experimentation, advice, and guidance in the world of dough and the grill seek out my good friend Dave of WeberCam fame. He will blow your mind. And yes, I've tasted his magic first hand. It's beyond awesome. I bring up Dave, because he would work the dough like the magic of a French baker. I, on the other hand, have found it best to employ a blender. Yes, a blender. I've made dough by hand, stand mixer, and food processor, but my Ninja blender with a dough blade beats them all. It makes easy look easier. Add the yeast slurry to the blender, then add the olive oil, salt, and flour. Place the lid on the blender. Run the blender until the dough forms a ball and the flour comes off the sides. This takes under two minutes. Remove the dough ball from the blender. The dough should be slightly tacky and when pulled apart, should stretch without breaking. Form into a ball by pushing and turning the dough. Place in a lightly oiled pan, cover, and place in a warm spot until it doubles in size, approximately one hour. Place the charcoal grate on the lower level. Add three scoops of charcoal and light the coals with the Snap-Jet Gas Ignition. Once the coals are lit, spread them out across the grate. Insert the cooking grate and Gourmet BBQ System Pizza Stone. Lower the lid. Leave the bottom vent open and the Rapidfire Damper up. Allow the grill to heat up to 600-650 F and let it hold for approximately 10-15 minutes. Lightly dust a work surface with flour. Remove the dough from the bowl, place on the counter, and punch down. Reform into a ball. Slice the ball in half. Each half makes about a 12-inch pizza. Using your fingertips, spread out the dough to make the pizza. If the pizza is shaped perfectly round, it's a classic pie. If it's misshapen, like mine always are, it's rustic. This is an important distinction for your guests! Top the dough with sauce, tomatoes, torn pieces of basil, and cheese. Sprinkle corn meal on a peel and slide the peel under the pizza to transport it to the grill. Before placing the pizza on the grill, I like to add some hickory wood chunks. Raise the hinged charcoal grate and diffuser plate to gain access to the coals. Once the wood begins to burn, slide the pizza onto the stone and lower the lid. The pizza takes about 3 minutes to cook. Slide the peel under the pizza and remove to a cutting board. Slice and serve. A classic Margherita is my all time favorite pizza, but when I'm hoarding leftover BBQ, anything goes. Case in point, my second pie was topped with a sour cream/mayo/cilantro base, carnitas, pickled red onions, and cheese. 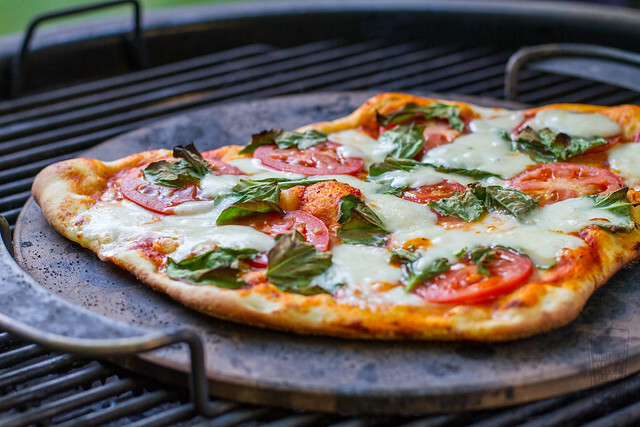 When it comes to grilled pizzas, anything goes and thanks to the Summit Charcoal Grill, my pizza grilling has never been better. Note: While my work for Weber is compensated, this post is based on my own experiences with the Summit Charcoal Grill and was not requested by Weber. Also, I have no affiliation with Ninja Blenders outside of the fact I like mine a lot. The opinions expressed are my own. What's on the Grill #100!